WomenWeave Charitable Trust (WW), is based in Maheshwar (Madhya Pradesh) and known for its high quality hand woven products like saris, stoles, dupattas, yardage and shawls made by rural women. Today, these products are exported to as many as 30 countries. WW’s contribution in reviving the tradition of popular and ethnic Maheshwari Saris has been significant. WW was the first organisation to involve women in weaving (mostly wives & daughters of male weavers). Weaving was introduced to women for two reasons: (a) empower women from marginalized backgrounds and make them financially independent, (b) preserve the tradition of weaving, as males, who earlier dominated the industry, now were considering working in other industries that paid them higher salaries than weaving. The organisation not only equips women with weaving and spinning, but also offers them employment, shelter, education and healthcare. 77% of WW’s total beneficiaries are rural women. WW has built several clusters of artisans in different cities and brought them together to share the know-how of good weaving. These clusters are supported by the local/partner NGOs. The role of WW here is to help them connect with end buyers directly, or act as an alternate buyer, in case the products are not sold. WW has its core group of weavers in Maheshwar and Dindori. Through other NGOs, the organisation helps Kota weavers in Rajasthan and Chanderi weavers in Maharashtra. Notable NGO partners include: Chirag (Uttaranchal), ANT (Assam), Kala Raksha (Bhuj). The production started only in 2009 and prior to that i.e. 2004 to 2009, WW was involved in organizing awareness programmes focused on health, sanitation, education, weaving etc. In a short span of time, WW established a strong supply chain management system, an advantage over other local weavers. As on 31st March, 2013, WW had sold their products to 70 buyers across the globe; with 75% of total orders received from Indian buyers. To promote its products, WW uses multiple sales channels. Business-to-Business (B2B) has worked the best so far for WW as 60% of annual sales was generated through this channel in last three years. Most of the balance produce is sold through exhibitions. Sales through virtual and physical stores have been minimal. Total Income: The total income in FY13 stood at Rs13mn v/s Rs17mn in FY12, posting a negative Y-o-Y growth of 21%. WW was largely supported by Non-Government Funding Agencies (NGFAs) prior to the organisation’s strategic decision to build up their sales network and generate its own income. Large charities like Sir Dorabji Tata Trust and HSBC Sustainability supported WW’s Gudi Mudi Khadi Project for a tenure of three years (FY09-FY12). 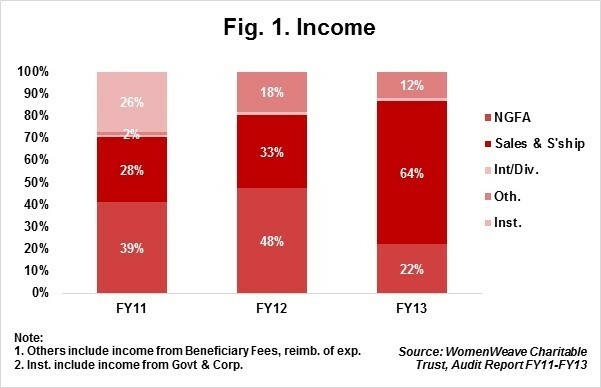 As only a residual amount was received during FY13 as per the contract terms, and with no other trusts coming on board, the total income declined in FY13. It must be noted, that the organisation has taken a conscious decision not to seek financial support from the Government and NGFAs from FY12. Individual donations: Donations received from individuals has remained NIL in FY12 and FY13 as the organisation has deliberately abstained from raising funds through this channel for a short tenure. However WW would welcome funds from individual donors in future. Sales & Sponsorship: Income generated from sales in FY13 was Rs9mn (64% on total income for FY13), suggesting robust demand for products manufactured by women weavers in Maheshwar. Income for this source posted a Y-o-Y growth of 54% in FY13. The growth is likely to continue, as appropriate measures have been taken to promote the weavers and their work. WW has recorded sales of over Rs130mn in the first three quarters of FY14. WW annually participates in popular art exhibitions hosted by Paramparik Karigar at Prince of Wales Museum, Sanchari Foundation’s Amazing Yards in Mumbai, HSBC Bank’s annual Mela, Kalaghoda Arts Festival, Delhi Craftspeople Council’s Dastkari Delhi. Other than exhibitions, WW has partnered with high end brands and designers to promote the weaver’s produce. Total Direct Programme Expenses: This includes two major cost items; (a) project costs and (b) salaries paid to people directly involved in executing the project activities. The total spend on direct programme related activity was Rs11mn, i.e. 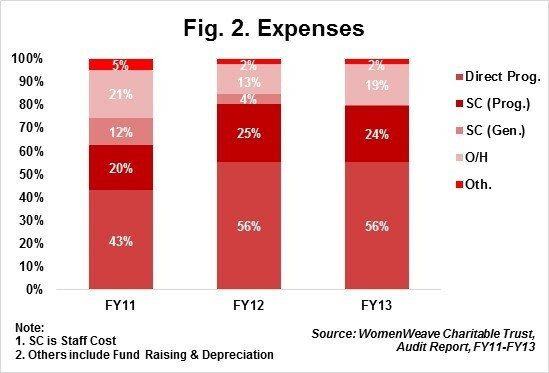 80% of total expenses in FY13, marginally lower than amount spent in FY12. The marginal difference is owing to lower income receipts in FY13 as stated in the section ‘Total Income’ above. Salaries (Wages): Compensation paid to weavers is directly linked to total production made by weavers. The weavers are not paid any fixed component. They are urged to be entrepreneurial and decide for themselves the amount they want to earn in a day. The wages are paid by WW on a weekly basis based on the weaver’s production. The minimum wage paid to a weaver per metre of handloom weaved is Rs40, 20% higher than the village and the industry standards. The maximum wage one can earn on weaving a metre is Rs110. Of course, the wage rate depends on the quality and the type of final output. WW is responsible to pay wages only to the weavers registered with WW and not to the cluster of weavers formed by them in partnership with other NGOs. The final output is then sold by WW at different exhibitions. In FY13, WW availed services from nearly 200 local weavers. Thus, the total wages paid to weavers during FY13 was Rs3mn. Trust Corpus & General Funds: WW has maintained a minimum trust corpus of Rs1,000 since past four years. No efforts have been made to increase the trust corpus. General Funds at the end of FY13 stood at Rs12mn, increasing from Rs6mn in FY12. The increase is attributed to Y-o-Y surpluses booked by the organisation. Inventory: WW had an inventory worth Rs8mn at the end of FY13, thus increasing the overall current assets. Inventory in case of WW is the raw material and the final products manufactured. Income Growth Rate: WW’s income growth rate for the last four years (FY10-FY13) has been very erratic owing to the fluctuating receipts from government, corporate and foreign sources. WW posted a Y-o-Y negative income growth rate of 21% in FY13. It must be taken into account that WW has strategically decided not to secure external funding for the next two-three years as they plan to sustain on its own income generated through ‘Sales’. It is important to consider, that despite the drop in total income, the Y-o-Y income from sales in FY13 has shot up significantly by 54%, suggesting right measures taken by WW to meet its strategic objectives. Self Sufficiency Ratio (SSR): Self-sufficiency ratio determines the organisation’s ability to sustain (meet operating expenses) from its own funds like donations from individuals, sales, membership fees and interest income. In FY13, the self-sufficiency ratio for WW was 80%, in line with that in the previous year. With rising number of buyers for WW’s products globally, and changing preferences of domestic buyers for hand made products over machine made products, will gradually help boost WW’s income from sales, thus making its SSR healthier. Support from Elite Brands & Charities: WW has received support from the premier brands like Good Earth, Anokhi, FabIndia and other renowned designers like Rahul Mishra, Sabyasachi Mukherjee, Savio John and Paromita Bannerjee. These brands have been working closely with the weavers, putting handloom on the fashion map. Large charities like Sir Dorabji Tata Trust, Dallas Foundation, HSBC Bank among others came forward to support the women weavers and the ultimate social cause promoted by WW. Skilled Admin & Marketing Staff: WW is currently in a growth phase and are in the market looking for people with good marketing and exceptional communication skills to broaden the buyer base globally. The organisation is grappling with the issue of hiring people as candidates are not willing to join WW because of its remote location. Support from Government: The handloom industry itself is going through a rough phase in India. In such a scenario, government- supported handloom weavers are producing poor quality output, as these products fail to undergo appropriate quality control checks. These products don’t easily sell in foreign markets because of their low quality and as a result adversely affects the brand image of the entire industry. Organisations like WW, despite producing high end quality products face challenges in convincing people to accept their products. WW is not seeking any financial support from the government, but appeals to the government to preserve the brand image of the traditional Maheshwari products, by ensuring use of right design and that quality products are sold across the globe. Founder and Trustee, Sally Holkar is best known for her contribution in reviving the handloom traditions of the famous Maheshwari Saris manufactured by weavers in Maheshwar. Prior to WW, she had co-founded Rehwa Society, also focused on handloom weaving. She is a graduate from Standford University and has over 40 years of experience in the Indian Handloom sector. She is actively involved in empowering the lives of rural women through handloom weaving. The Board of Trustees include two other distinguished personalities from the industry: Ms. Sunita Namjoshi, with four decades of experience in textiles and Ms. Subhasini Ali, Co-chairperson of All India Women's Council who has also worked with Central Cottage Industries Emporium. Ms. Ali is a social activist and works for protecting women rights. The Board of Trustees is composed of three trustees as stated above and they meet formally only once a year. WW’s Board Members, consists of five members and they meet once every quarter. The organization doesn’t follow the conventional way of conducting meetings. However, recordings of all these meetings are stored as a soft copy. The organization is currently looking to induct more people on the Board with diverse background like: finance, social entrepreneurship, marketing and art & designs. WW is listed with GuideStar India & United Way.